A unique mid-block church designed by architects Dixon & Carson on Lafayette Square. This overview is adapted from the Historic American Building Survey record of the building. Home since 1929 to the St. John A.M.E. congregation (organized in 1855), this church began as Lafayette Square Presbyterian (organized in 1879), the only congregation of that denomination to locate on Lafayette Square. This church, which is faced in the same green serpentine stone used by architects Dixon & Carson (a partnership of Thomas Dixon and Charles L. Carson) for the Mount Vernon Place Methodist Church (1873) and the Central Presbyterian Church on Eutaw Place (completed 1879), combines the partnership’s favorite Gothic revival motifs: richly colored and patterned stonework, an abundance of colonettes and thoughtfully-placed carved foliate ornament, modest clerestories, turrets, and towers, grouped lancet windows (often in sets of three), and a clear overall massing expressive of the different spaces within the church. Complementing the steeple on the main facade are two decorative flying buttresses, whose dramatic juxaposition above the north portal identifies this building as late Gothic revival in sentiment and style. The Baltimore Presbytery considered at least one other design submitted by Edmund George Lind, the architect of the Peabody Institute and a number of Gothic revival churches in the city. Severely damaged by fire in 1943, the church was rebuilt by the St. John’s congregation within two years despite a myriad of wartime financial and material obstacles. Close view looking to north portal with decorative flying buttresses above by James W. Rosenthal, 2004. Courtesy Library of Congress (PD). The twenty-fifth anniversary of Lafayette Square Presbyterian Church, Carrollton avenue, near Lanvale street, will be celebrated with elaborate and impressive services tomorrow, Thursday and Friday evenings. All arrangements for the celebration have been completed and the affair promises to be one of tbe most successful in the history of the congregation. The services will be under the direction of the pastor. Rev. Duncan M. Buchanan, who will be assisted by several other Presbyterian clergymen and laymen. […] Lafayette Square Church is one of the largest and strongest Presbyterian churches in this city. The congregation is the direct outcome of three churches. In 1875 the Presbytery of Baltimore united the Constitutional and Dolphin Street Churches into a new church, giving it the name of the Lafayette Square Presbyterian Church. For five years that congregation worshiped in the Dolphin street building, but had no settled pastor. Meanwhile the large and unique building, faced with serpentine greenstone, with its peculiar and pretty tower, with its churchly front and flying buttresses, standing on the western side of Lafayette Square, was in process of construction. By the time it was finished the membership of the then existing Lafayette Square Presbyterian Church, being widely scattered, had dwindled away. It was then decided to disband the church, and out of the active membership remaining to organize a new Lafayette Square Presbyterian Church in the completed building on the square. This was done by order of the Presbytery February 23, 1880. Prominent in tbe committee of organization were the late Rev. Dr. John C. Backus, the Rev. Dr. Joseph T. Smith and Mr. Elisha H. Perkins. The first pastor was Rev. Samuel McLanahan. He was installed in May, 1880, continued as pastor until July 1, 1893, and is now pastor at Lawrenceville, N. J. He was followed by Rev. Robert J. Rankin, who was installed November 28, 1803, and died June 5, 1804, providentially terminating, to the great sorrow of the congregation, a most successful pastorate of less than seven months. Rev. Llewellyn Stover Fulmer was called from Abingdon, Pa., and installed January 4, 1895. The membership grew steadily under his ministry until he resigned in September, 1001, and went to Montclair, N. J. For over a year the congregation was without a pastor, till Rev. D. M. Buchanan came, in October, 1902. The present membership is over 400, very few of whom were in the church in its earlier years. The church is thoroughly organized In all departments, with 8 elders, 11 deacons and 12 trustees. we have at present great prospects in the city of Baltimore of this being the greatest conference ever held in this place. Great harmony prevails among our preachers and the slain of the Lord are many. In the month of October, 1855, the Rev. James R. Sterret, who had been appointed as a missionary operating in the city of Baltimore, by Bishop Quinn, was casting about for a place to house the congregation of the newly organized St. John A.M.E. Church. Shortly after this all these structures were condemned and to protect the safety of its members the church was forced to tear down the houses and rebuild at a cost of some $11,000. This was the lowest possible figure that could be obtained on building costs, at the time. During 1869 the Rev. J. J. Herbert was returned to the church for a second term. It was during his administration that the basement of the building was completed. In 1872 when the Rev. Jacob Nicholson came to the mission the name of St. John A.M.E. Church was given to this congregation. […] In 1892, under the administration of the Rev. O. D. Robinson, who remained four years, the church was rebuilt a second time, this time on Lexington Street. The new structure cost $7,000. It was dedicated to God and to African Methodism in 1894 by the Right Rev. W. J. Gaines. He succeeded in purchasing the present structure for $56,500. It was the fine co-operative spirit of Mr. Henry W. Ebb, chairman of the financial committee of the church and also a trustee, who lent the church $1,500, that enabled the congregation to put the deal through. The old building was sold for $25,000. The present church building was dedicated by Bishop A.L. Gaines April 17, 1929. With 76 years of illustrious history back of it. St. John A.M.E. Church is not only famous because it has given to the bench of bishops five eminent men, but also because it is probably the first church in Baltimore to have a woman member of its board of trustees. St. John AME Church, located at 810 N. Carrollton Avenue, is generally acknowledged to be one of the most beautiful in the city. Not only is its exterior, with its numerous steeples and graceful Gothic lines, a thing of beauty, but the inside is also conducive to a feeling of reverence not always found In Protestant churches. Built along cathedral lines, the edifice has naves extending from the main body of the church, an organ niche and huge arches decorated with pure gold leaf. The present pastor, the Rev. Henri Ralfe Tomlin, was appointed to St. John’s five years ago. At that lime the church had a $27,000 indebtedness which has since been reduced to $14,000. In addition, the church parsonage has , been completely renovated. […] The church has approximately 1,000 members, about 600 of whom attend services regularly. Fire, believed to have been caused by an overheated furnace, destroyed St. John AME Church, 810 N. Carrollton Avenue, Wednesday evening. No one was hurt. Damage is estimated at $40,000. Answering the first of six alarms sounded at 7:08 p.m. by James B. Copeland, who happened to be walking in the neighborhood, firemen found the entire edifice a mass of flames. Adjacent buildings, including the N. M. Carroll Home for Aged at 822 and Emmanuel Christian Community Church at 800, were endangered. A crowd of nearly 2,000 watched as firemen, aided by auxiliary civilian defense workers, worked frantically for four hours to bring the blazing inferno under control. By midnight, however, only a handful of spectators were on hand. Firemen were on duty until Thursday morning. The congregation spent two years worshipping in Metropolitan Methodist and Allen A.M.E. Churches before returning to their building on April 15, 1945. The Rev. Issac Gray succeeded Pastor Bryant in 1949. Under Rev. Gray, St. John was maintained as one of the most beautiful church edifices in Baltimore. After 15 years the Rev. Joseph Grant succeeded Pastor Gray in 1964. Pastor Gray served St. John well until his untimely death in 1970. The present Pastor, the Rev. Benjamin S. Foust was appointed to St. John in June of 1970. The St. John congregation is a stable congregation of approximately 800 participating members. Approximately one fourth of the members have joined in the past six years. Bible centered preaching, worship that is both liturgical and evangelical, an active youth program. an ever increasing lay participation, and a strong emphasis on good church music are the strength of the church. The Rev. Benjamin Samuel Foust did his undergraduate studies at Shaw University and his graduate studies in theology at Duke University Divinity School and Southeastern Seminary. He was awarded the Doctor of Divinity Degree from Allen University for his outstanding achievements as a “Street Prophet” during the Civil Rights Movement on the 1960’s. He has pastored throughout North Carolina. For six years he served as Episcopal District Director of Christian Education and Retreat Coordinator. He is a former public school teacher and President of Kiltrell Junior College. Dr. Peggy E. Wall, pastor, sister, teacher of the Gospel and woman in Christ for 10 years has stood at the altar at St. John A.M.E. Church preaching the Word of God and serving as the spiritual guide to her members, will be honored with a celebration for her 10th Anniversary at the historic St. John A. M.E. Church in West Baltimore. “6 Supreme Bench Hopefuls Grilled at NAACP Meeting.” The Sun (1837-1991); Baltimore, Md. March 26, 1980. “25 YEARS A CHURCH: Lafayette Square Presbyterian Congregation To Celebrate.” The Sun (1837-1991); Baltimore, Md. February 21, 1905. “A. M. E. CHURCH FIRE BRINGS 5 ALARMS: Freezing Weather Hampers Fighters At Lafayette Square Conflagration.” The Sun (1837-1991); Baltimore, Md. March 4, 1943. “A. M. E.’S TO DEDICATE NEW CHURCH HERE: Bishop Gaines Announces New Acquisition At Ministers Meeting RICHARD ALLEN DAY Churchman Lauded At Monday Meeting.” Afro-American (1893-1988); Baltimore, Md. February 16, 1929. “A Rousing, Meeting at St. John’s A. M. E. Church.” Afro-American (1893-1988); Baltimore, Md. April 2, 1910. “Alexander Cooper, 65, Buried on Thursday.” Afro-American (1893-1988); Baltimore, Md. October 1, 1960. “All for Africa.” Afro-American (1893-1988); Baltimore, Md. September 26, 1908. Alvarez, Rafael. “Dr. King’s Legacy to Young: ‘It Means White and Black People Can Be Friends.’” The Sun (1837-1991); Baltimore, Md. January 16, 1986. “Article 2 – No Title.” Afro-American (1893-1988); Baltimore, Md. January 13, 1906. “Baltimore NAACP to Meet December 8 SDA.” The Sun (1837-1991); Baltimore, Md. December 5, 1981. “Carolyn C. Brent: Former Welder.” The Sun (1837-1991); Baltimore, Md. July 22, 1990, sec. Maryland. Carroll, Samuel. “An Announcement from St. John’s A. M. E. Church.” Afro-American (1893-1988); Baltimore, Md. June 21, 1918. “COLORED NORMAL SCHOOL: Diplomas of Graduation Conferred Upon Seven Young Women at St. John’s A. M. E. Church.” The Sun (1837-1991); Baltimore, Md. June 29, 1897. “Congregation Headed by Dr. D. E. Rice No Occupies a $56,000 Home: First Building on Tessier Street, with the Rev. A. W. Wayman (Later Bishop Wayman), Standing on a Chair to Preach the Sermon, Subject, ‘How Glorious Is This Place.’ Church Has Had 38 Pastors, Three of Them in One Year (1910), and Has Given the Denomination Five Bishops. This Is the Twelfth of a Series of Articles on Baltimore Churches.” Afro-American (1893-1988); Baltimore, Md. December 26, 1931. “DEATH OF REV. J. C. WATERS: The Funeral Was Largely Attended From St. John’s A. M. E. Church–Was Formerly President Of Allen University, Columbia, S. C.–Rev. D. P. Seaton Had Charge Of The Services.” Afro-American (1893-1988); Baltimore, Md. July 2, 1910. “Electoral College Meets.” Afro-American (1893-1988); Baltimore, Md. September 6, 1902. “ENDEAVORS TO MEET: Allen League To Gather At St. John’s A. M. E. Church.” Afro-American (1893-1988); Baltimore, Md. November 26, 1920. “First Woman Pastor In AME Church: Bishop Appoints Rev. Mrs. Swann To Basil Church.” Afro-American (1893-1988); Baltimore, Md. May 9, 1953. Harleston, Edwina. “Church of Beauty.” Afro-American (1893-1988); Baltimore, Md. May 2, 1942. 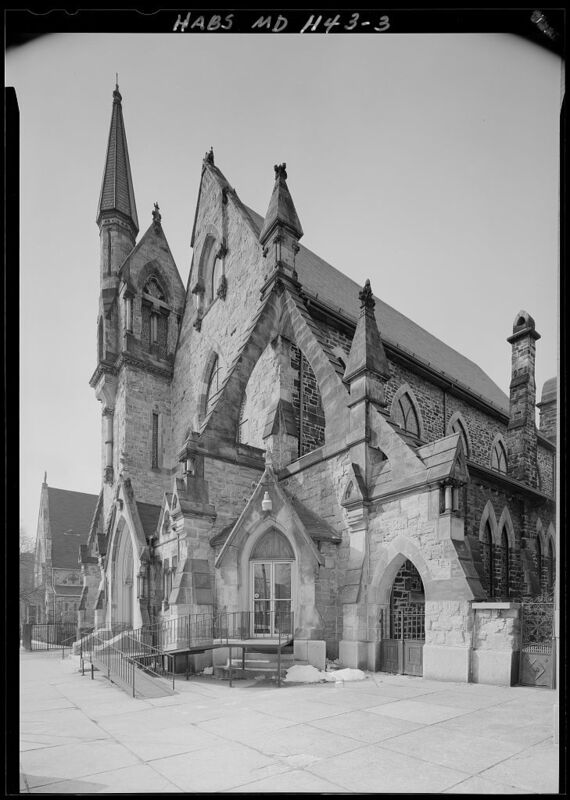 “Lafayette Square Presbyterian Church.” The Sun (1837-1991); Baltimore, Md. February 9, 1885. “M . Marie Tarver.” The Sun (1837-1991); Baltimore, Md. March 15, 1984. “Many Flee Homes as Flames Gut $56,000 St. John Church: Women Serve Coffee to Firemen as They Battle All Night with 6-Alarm Blaze in Biting Cold.” Afro-American (1893-1988); Baltimore, Md. March 13, 1943. “Margaret C. Kwedar: Hairdresser 56 Years.” The Sun (1837-1991); Baltimore, Md. March 18, 1985. “MASONS HOLD SAINT JOHN DIVINE SERVICE: The Rev. J. W. Waters Delivers Sermon To Crowded Auditorium LOYALTY OF MEMBERS PRAISED BY W. ALLEN Five Hundred Turned Away And Collection Of $201.50 Was Taken.” Afro-American (1893-1988); Baltimore, Md. January 15, 1927. “MAY BUY CHURCH IN LAFAYETTE SQUARE: Independent Methodists Said To Be Negotiating Purchase PRICE REPORTED AS AROUND $45,000 Independents, 12 Years Old Flourish Under Leadership Of Dr. Curtis.” Afro-American (1893-1988); Baltimore, Md. January 9, 1926. “Mayor’s Secretaryl Addresses Elks.” Afro-American (1893-1988); Baltimore, Md. November 17, 1945. McKenzie, Vasgti. “Oak Street A.M.E. Church.” Afro-American (1893-1988); Baltimore, Md. June 13, 1987. “Mrs. Blake, Active in Church.” The Sun (1837-1991); Baltimore, Md. April 25, 1978. “Mrs. Lottie Lewis, 80, Was St. John Pioneer.” Afro-American (1893-1988); Baltimore, Md. October 16, 1965. “Mrs. Pearl Burley Simpson, Long Active in Church Work.” The Sun (1837-1991); Baltimore, Md. January 22, 1978. “MRS. SCOTT’S RITES TODAY: Teacher In Public Schools Died Saturday.” The Sun (1837-1991); Baltimore, Md. September 29, 1964. “OBITUARIES: Isaac Gray Dies at 87; Retired A.M.E. Minister.” The Sun (1837-1991); Baltimore, Md. May 26, 1984. Ollove, Michael. “Mitchell, Cheeks Continue Verbal Jabs.” The Sun (1837-1991); Baltimore, Md. June 28, 1986, sec. Maryland. “PROMINENT PASTOR DEAD: Rev. Samuel McLanahan, Formerly Of Lafayette Square Church, Dies In New Jersey.” The Sun (1837-1991); Baltimore, Md. November 4, 1912. “Religious Spirit High at St. John’s.” Afro-American (1893-1988); Baltimore, Md. January 22, 1916. “Rev. Wortham Dies Suddenly.” Afro-American (1893-1988); Baltimore, Md. May 10, 1918. “Rites for Herbert Bailey Held at St. John’s Church.” Afro-American (1893-1988); Baltimore, Md. August 15, 1953. “St. John Ame Church.” The Sun (1837-1991); Baltimore, Md. November 28, 1984. “St. John AM.E. Church, Balto.” Afro-American (1893-1988); Baltimore, Md. June 13, 1987. “St. John Church Dedicates Rebuilt $175,000 Edifice.” Afro-American (1893-1988); Baltimore, Md. June 23, 1945. “St. John’s A. M. E. Church Has a Great Rally on Thanksgiving Day.” Afro-American (1893-1988); Baltimore, Md. December 6, 1918. “ST. JOHN’S CELEBRATE 50th ANNIVERSARY.” Afro-American (1893-1988); Baltimore, Md. November 7, 1919. “TEN CHURCHES PROTEST PURCHASE BY NEGROES: Two Meetings Held In Effort To Halt Deal Over Harlem Avenue Edifice ACTION TO BE TAKEN MONDAY Resolutions Adopted At Community Rally Say Sale Would Violate Golden Rule.” The Sun (1837-1991); Baltimore, Md. September 24, 1921. “TWO BISHOPS AT NEW CHURCH DEDICATION: St. John’s A. M. E. Church Is Formally Opened by Bishops Gaines and Hurst. COST $56,000 Main Auditorium Has 500 Seating Capacity.” Afro-American (1893-1988); Baltimore, Md. April 13, 1929. “WILL CARRY CAMPAIGN TO CHURCH DOORS TODAY: Petitions Protesting Sale To Negroes To Be Circulated Among Worshippers.” The Sun (1837-1991); Baltimore, Md. September 25, 1921. “WILL CONSECRATE NEW CHURCH SITE: Lutherans Also To Break Ground At Howard Park TO MARK ANNIVERSARY South Baltimore Station M. E. Will Hold Celebration Next Week.” The Sun (1837-1991); Baltimore, Md. November 19, 1927. Except where otherwise noted, content on this site is licensed under a Creative Commons Attribution 4.0 International license. Created by Baltimore Heritage. Powered by Jekyll & Minimal Mistakes.